24/7 the Game is an exciting strategy game that combines elements of luck and skill. Using durable plastic tiles on a full color game board, players take turns laying tiles on a 7Ã—7 grid and score points for adjacent tiles that create runs, sets and sums of 24 or 7. In 24/7, players score for combinations of tiles in four directions. While the importance of tile placement and strategy is key to winning, the element of luck magnifies as the combinations of tiles take shape in all four directions. Play a tile and score points or block your opponent from scoring. In 24/7 the Game by playing the right balance between offensive and defensive placement, youâ€™ll keep your opponents on their toes and rack up the points. 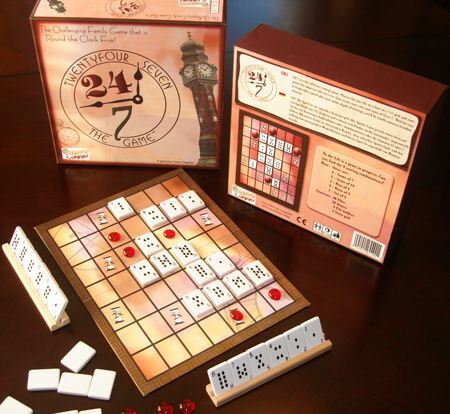 24/7 has an ingenious mechanic that constantly changes the landscape of the game board. No matter how many times you play, no two games are ever the same.